Concealer is a vital step in my transformation from a zombie to a somewhat presentable human every morning – it’s my miracle product! With such a wide variety on offer, finding the perfect one for your skin can seem a bit of a daunting challenge. Over the years I’ve tried various ones from drugstore to highend, and today I wanted to share my top 3 with you. Now I’m aware that all three of the concealers I’ve mentioned in this post are highend and aren’t exactly purse friendly, but these are the ones that work best for me. Of course I could’ve included drugstore options for the sheer sake of them being affordable, but that wouldn’t be honest. I personally prefer to invest in my base (foundation, concealer, powder) as my skin just gets on better with them. Rant over. Starting off with this incredible option from Kevyn Aucoin. This concealer sat on my wishlist for literally years, but I just couldn’t justify spending £36 on it – I mean common that’s nearly a weekly shop there! When I got some money for Christmas I decided it was finally time to tick this beauty off the wishlist and it’s soon won the SColvinBeauty sealed approval for being the highend coverage concealer I’ve come across, and trust me I’ve tried a fair few! The thing I love about this concealer is that although it’s thick, it doesn’t look heavy or caked on and helps gives an almost blurred look to the skin. It lasts amazingly on the skin, this stuff is literally bulletproof. I know that I can leave the house wearing it at 7am and it’ll still be firmly in place at 9/10pm that night. I really do think this concealer is worth the investment as the quality is incredible and you only need such a tiny amount so this little pot is going to last a long time. I’ve found the best way to apply with is to take a tiny amount (a little really does go a long way with this!) on my Zoeva 310 Spot Liner Brush and dot it onto the areas I want to cover then blend it out with my ring finger. If I’m using it on a larger area I’ll simply dab a bit more onto the area and then blend it out with my Beauty Blender. I bought the Urban Decay Naked Skin Concealer after hearing great reviews about it and how it’s better than the MAC Pro Longwear Concealer (I have a love/hate relationship with that, hence why it didn’t make it to this post) so I was looking forward to giving it a try. This fast became my favourite under eye concealer and the one I reach for daily for a number of reasons. The thing I love the most about this is the formula, it’s so lightweight and almost invisible on the skin whilst still providing a good amount of coverage to hide them pesky dark circles. As the formulas so lightweight it’s easy to build without caking or looking thick and dry on the under eye area. It photographs beautifully on the skin and really does cover my under eye area brilliantly. To apply it I like to simply sweep it under my eye in a triangle shape and then blend it out with the pointed end of my Beauty Blender. If I’m going for a more extreme makeup look -such as for an Instagram makeup look- I like to set and bake it with the Laura Mercier Translucent Setting Powder, the pair work beautifully together. This concealer is a brilliant option for the under eye area! Coverage: Medium to full buildable. This is about the 9th maybe even 10th time I’ve repurchased this concealer over the years so it goes to show just how much I love it. I always like to have one in my beauty area for everyday wear as well as one in my handbag for any touchups I may need during the day, or if I’m out for lunch and realised there’s a beautiful spot looming on my face that I missed covering that morning. The formula is more on the thick side, but it’s still really wearable and doesn’t cake up and look thick on the skin. The thing that draws me into this concealer and keeps me repurchasing it time after time is the fact I can use it to concealer problem areas as well as my under eye area as it isn’t too thick or drying – something I find rare in a concealer! To apply it I like to use the wand to put a small amount on the back of my hand and then apply it to the skin with my ring finger (or a brush – but let be real I’m in a rush 99% of the time) and then blend it into my skin using my beloved Beauty Blender. On days that makeup is just too much effort, like today, I’ll just put some of this on areas I want to cover (acne scarring, thanks teenage skin that never wants to heal) and some mascara and I’m ready to go. Left to right: Kevyn Aucoin Sensual Skin Enhancer, Urban Decay Naked Skin, NARS Radiant Creamy Concealer. To give a little look into the coverage level of each of the concealers I thought I’d test them over my tattoo to see how well they cover it. I used one layer of each without setting with a powder to show you what they look like on the skin. As you can see, the Kevyn Aucoin Sensual Skin Enhancer certainly covers the most, in fact with a second layer I think I would have fully concealed the tattoo. 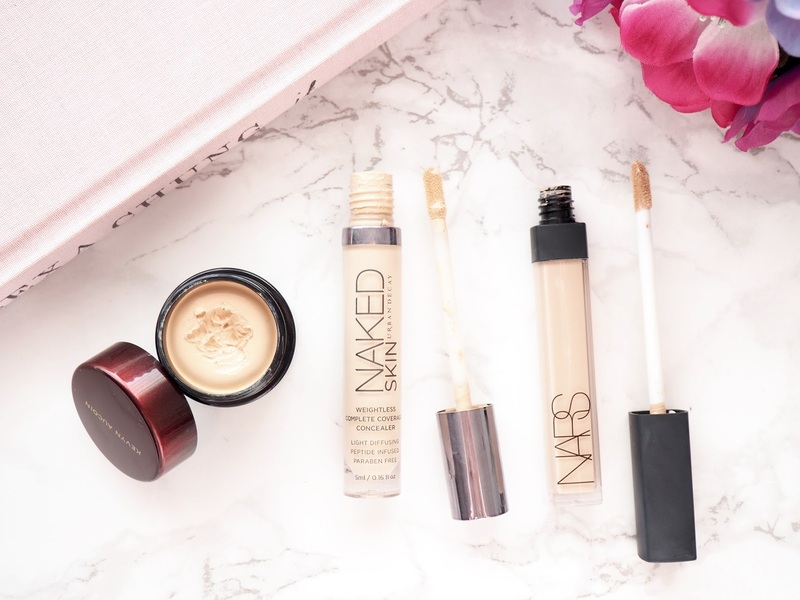 The Urban Decay Naked skin has the lightest coverage but the most lightweight formula followed by the NARS Radiant Creamy which I find works better when built up to the desired coverage. 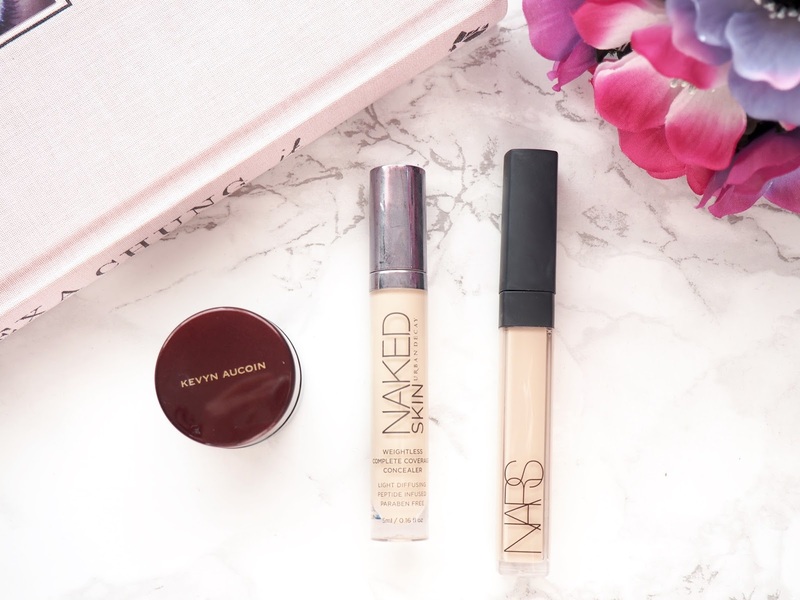 So those are my must have concealers, hopefully you found this post somewhat helpful!